Airdrieonians manager Eddie Wolecki Black is in a stable condition after taking ill during half-time of Saturday's win at Cowdenbeath. Wolecki Black, 50, was taken by ambulance to Victoria Hospital in Kirkcaldy. 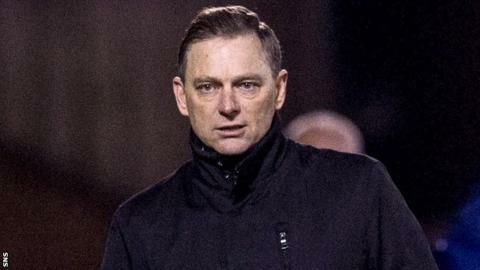 The former Glasgow City head coach took over from Gary Bollan in December after the latter had joined Forfar Athletic. Airdrie thanked their physio Kirsty Hughes and Cowdenbeath "for their prompt and professional response". Former Montrose player and manager Wolecki Black had initially joined Airdrie in September as director of coaching. That followed a spell working with Edusport Academy - a Scotland-based football academy for young French players - and a highly successful period in charge of Glasgow City. City won four successive Scottish Women's Premier League titles during Wolecki Black's time in charge and also reached the Uefa Women's Champions League quarter-finals for the first time in 2014. Airdrie's 3-1 win at Cowdenbeath's Central Park moved them up to fourth in Scottish League One, just inside the promotion play-off zone.